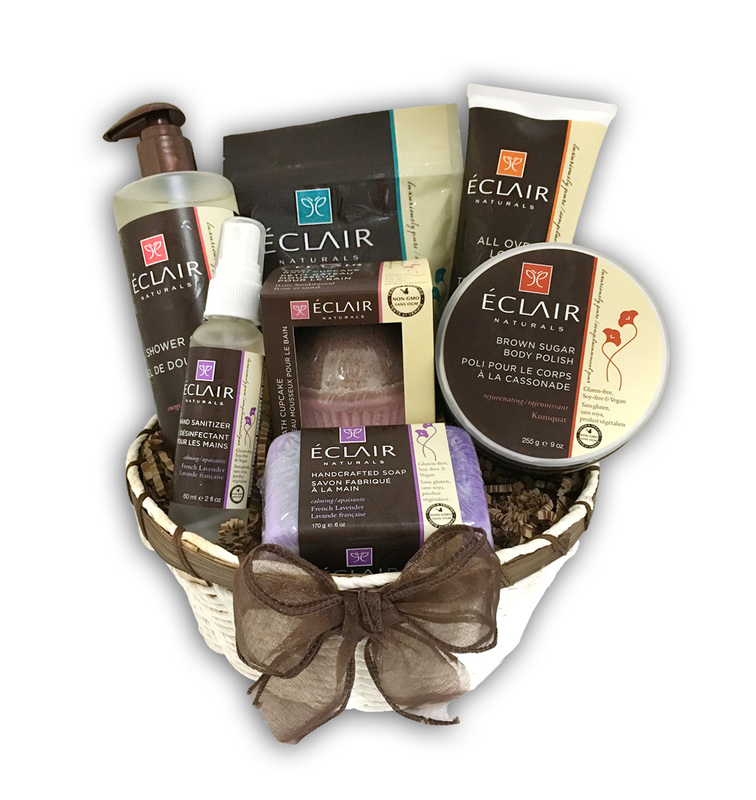 I’ve fallen in love with Eclair Naturals gluten-free body products! There are many things to love about this brand, but overall I love that they use only high quality ingredients and I’m amazed that each item sells for only around $10. Nice!! The big takeaway from the Eclair Naturals recent launch event in Manhattan was how committed this company is to creating a complete line of body care products that are “luxuriously pure” and non-gmo verified, gluten-free, soy-free, cruelty-free, vegan and made in the USA. And some of their products even contain Dead Sea Salts! 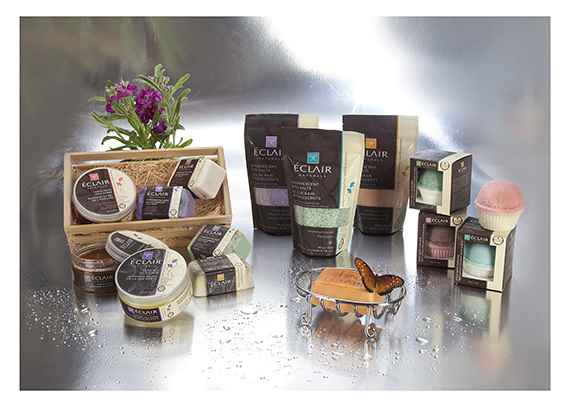 Dead Sea salts are usually only found in very pricey department store body care products, but you can find Eclair Naturals at your local Rite Aid and Target.com!! I’m so happy the people behind Eclair Naturals body care products reached out and introduced themselves to me! I’m loving the bath salts, body lotion and hand soap right now. I’ll have to share more about their whole collection of products over the next few months. 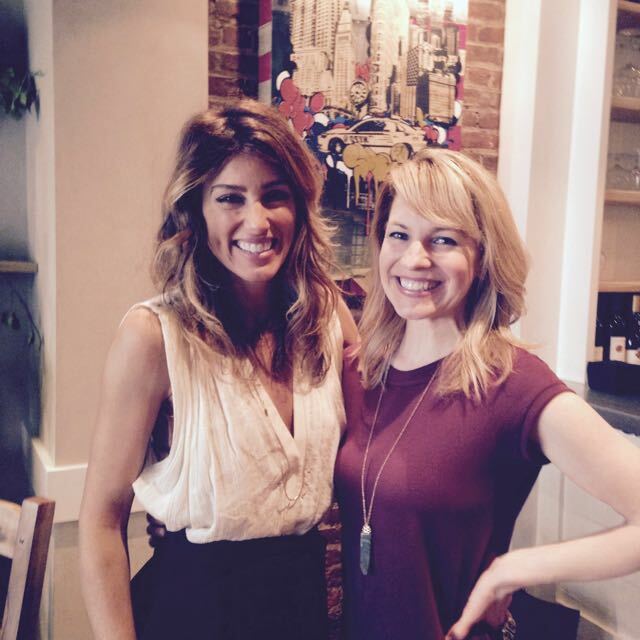 And btw, I finally met the lovely actress and Jennifer’s Way gluten-free bakery owner Jennifer Esposito at the Eclair Naturals launch event! We’ve chatted on the phone before, but never in person. She’s seems like a very sincere person and explained to the group as the brand’s spokesperson how proud she is to represent these natural products that use such wholesome ingredients. Are Gluten-Free Body Products Necessary? I know that the verdict is still out on gluten in body products. 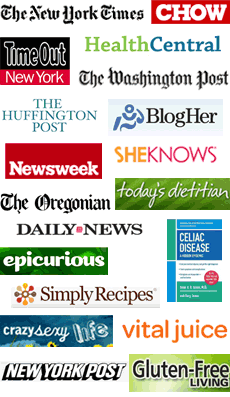 The medical community states clearly that it shouldn’t be a problem since gluten has to be ingested to affect the intestines, but many celiac patients claim that topical gluten does affect them. It’s a personal decision to use gluten-free body products and I totally understand someone not wanting to put gluten on their body – for many reasons. That said, whatever side of the gluten-free fence you’re on when it comes to gluten-free body products, there are chemical ingredients that everyone – gluten-free or not – should be aware of. The good news is that YOU get to make an informed choice about what to put on that hot body of yours! 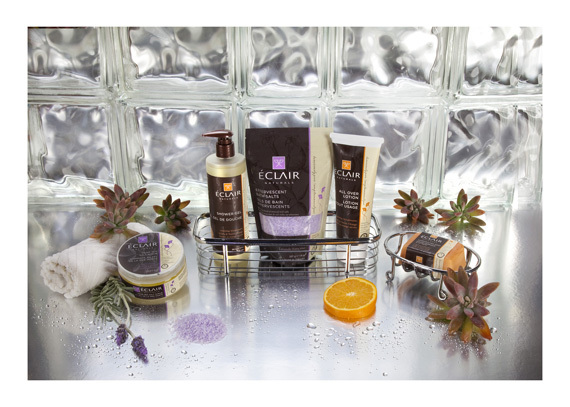 And now you have easy access to Eclair Naturals amazingly luxurious, safe and affordable body products. Not only are all Eclair Natural products made from food grade ingredients, non-GMO verified, gluten-free, soy-free, cruelty-free, vegan and made in the USA, but they are free from the below list of common ingredients that are potentially harmful. GMOs – Genetically Modified Organisms. Why mess with Mother Nature when there are great natural options? Parabens – Synthetic chemicals used as antimicrobial and antifungal preservatives but are known as hormone disruptors and have been found in the tissue of breast cancer tumors. PEGs – Polyethylene Glycol. Synthetic chemicals that function as surfactants, cleansing agents, emulsifiers, skin conditioners and humectants. PEGs are thought to potentially increase cancer risks. Petroleum – Derived from crude oil, used to manufacture plastic, fertilizers and pesticides. Disrupts the natural protective layers of our skin. This is not a sustainable ingredient. Phenoxyethanol – A synthetic chemical used commonly as a preservative system for body care products. An extremely hazardous substance that is an irritant to skin and eyes and is toxic to kidneys, the nervous system and liver. Phthalates – Synthetic chemicals commonly found in fragrances and hair care products. The EPA has put Phthalates on the list of chemicals that “may present a risk” to human health because they disrupt hormone activity. Propylene glycol – A synthetic solvent which is a strong skin irritant. It easily penetrates the skin and can weaken cellular structure. A common ingredient in antifreeze. Potential links to liver and kidney damage. Sodium Lauryl/Laureth Sulfate (SLS) – A synthetic detergent that can be drying and harsh for the skin and hair, causes eye irritation and is a suspected gastrointestinal and liver toxicant. Synthetic colors – Their colors come from plant extracts and natural minerals. They do not use synthetic food colorants or dyes commonly used in the industry. Synthetic fragrances – Their fragrances are derived from essential oils and essential oil blends as opposed to synthetic alternatives. While this has a cost impact, they believe the outcome is well worth it. Remember, just because a company claims its products are “natural” it is not always true and there are legal marketing loopholes that make it easy for brands to throw that term around. With Eclair Naturals you can trust none of the above mentioned harmful things are in their products. That’s reassuring for any of us living with celiac who have learned to understand that what we put in our bodies can be as important as what we put on them. DIRECTIONS: Follow this link to Eclair Naturals Facebook page. Like their page and leave a comment about what product you’re excited to try. The winner will be announced next Tuesday, October 18th. I would love to try any of their products, but I am most excited about the bath salts. I love a good bath! I can’t believe I’ve never heard of them and I’m all about cruelty-free and vegan products! I really want to try their salt scrub, with the weather starting to change I know dry skin is just around the corner. Hopefully the scrub will help! Hi Miranda , please follow the link to their FB page to enter. See directions at end of blog post. ? I’ve never heard of this brand, but love that I can find it at Target and not just a specialty store! Hi Kristina, please follow the link to their FB page to enter. See directions at end of blog post. ? if the product is as wonderful as the packaging, definitely a winner! Hi Cynthia, please follow the link to their FB page to enter. See directions at end of blog post. ? I haven’t seen this gluten free beauty product line. I’m excited to check them out. Not only is the product line [food grade ingredients, non-GMO verified, gluten-free, soy-free, cruelty-free, vegan and made in the USA] they won’t make my body itchy/go into hives. Would love to try the lotions, deodorant, styling gel and well all of it!!! Thanks for the post, review, and chance to potentially try the product line! Hi Courtney, please follow the link to their FB page to enter. See directions at end of blog post. ? Not only are the products at Two Trees Apothecary GF they are medicinal, created by hand by an acupuncturist. Is there a retailer in Canada that sells this line? Hi LeighAnn, please follow the link to their FB page to enter. See directions at end of blog post. ? I’m excited about your coconut products and would love to try any of them! Hi Debbie, please follow the link to their FB page to enter. See directions at end of blog post. ? I am excited to try Eclair Natural’s Grapefruite Shower Gel….I love bath and body products that smell like grapefruit. Hi Becca, please follow the link to their FB page to enter. See directions at end of blog post. ? I already like their page! I would really love to try their mango body butter. I liked their Facebook page. I want to try many products but the first one being the coconut shower gel. I have yet to find a body wash I really like. Thank you. I would love to try the hot bath salts!! We love the Mango Body Butter and the hand crafted vanilla and sweet orange soap! Thanks for introducing us to these amazing products Kelly!